I spent a while converting founding documents to HTML so they would be easy to read on any device. Working with one of the lawyers at the court, we put together a plan for including references and relevant documents within the main document. The idea was to treat the legal texts in a similar way to scribes with religious texts in medieval times: glossary, annotations, marginalia as well as related documents and court records. We would have definitions of legal terms, short explanations of various areas and links to relevant decisions (building upon earlier keywords projects at the ICC). 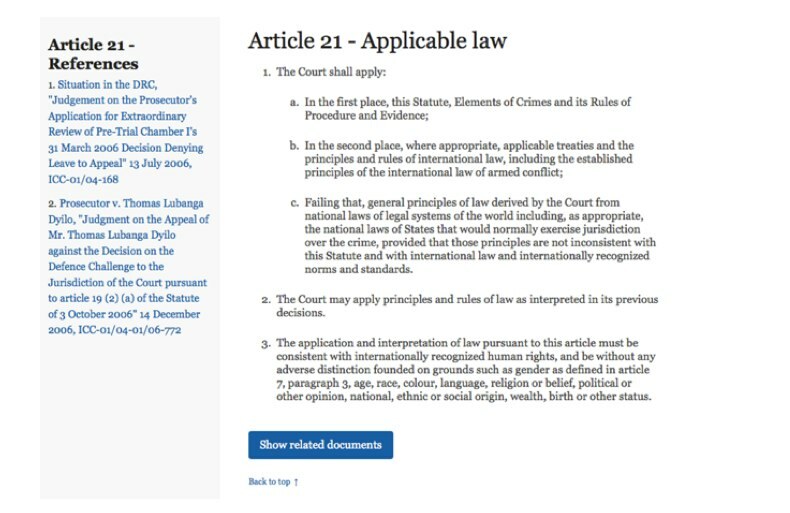 This approach puts the legal texts at the heart of everything - which is how lawyers at the ICC actually work - whereas at the moment they get sidelined. That area could also have explanations and stories about how the law has affected people’s lives. You can see it in action here, but this idea (which I thought was pretty good) never made it to live.